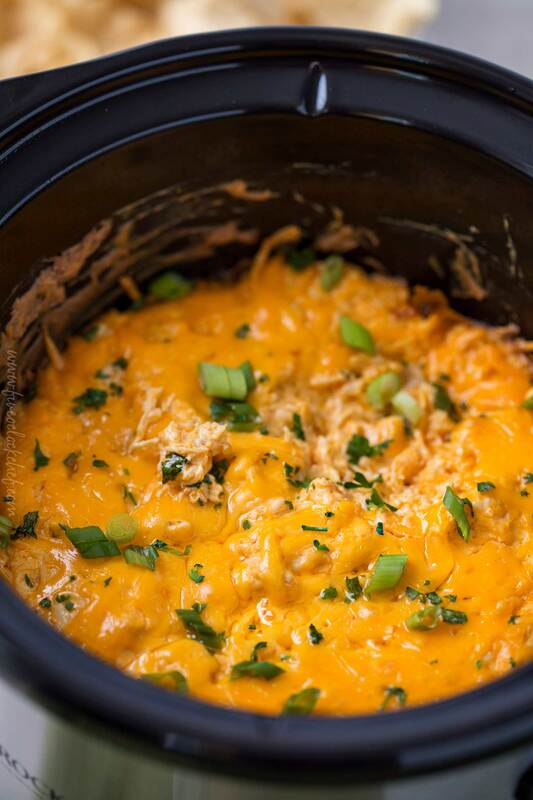 Classic buffalo chicken wing flavors are made into an easy crockpot dip. 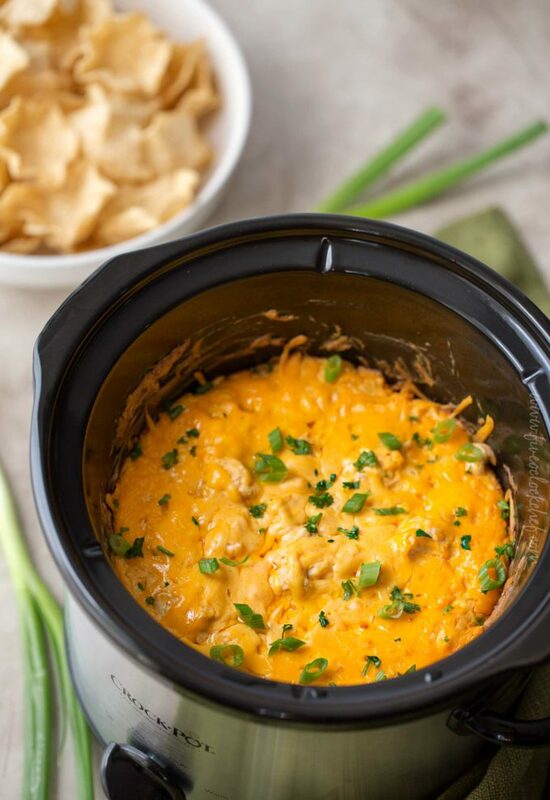 This buffalo chicken dip recipe uses simple ingredients and requires hardly any hands on time… just add things to the slow cooker and let it do the work! Let’s talk appetizers. Party food is, simply put, the BEST food out there! 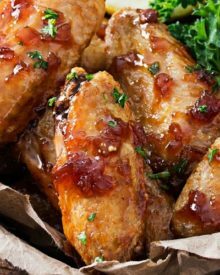 Probably one of the most quintessential party foods are chicken wings… with buffalo flavor being the most popular. I love a great chicken wing, but sometimes I don’t want all the mess. At parties, usually we’re all dressed up right? 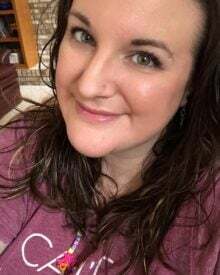 And ladies, we’re probably wearing some kind of makeup… which doesn’t look all that great with bright orange buffalo sauce all down our chins lol. If you’ve come up with a mess-less way to eat chicken wings, seriously, please let me know! 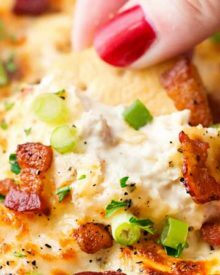 Most of you have probably had a version of this buffalo chicken dip recipe before… I know I have. At parties, and even on the appetizer menu at many restaurants, it’s quite the popular dip! Now you can make this restaurant quality dip recipe at home! And it couldn’t be more simple. Combine the cream cheese, ranch dressing, sour cream, some of the blue cheese, shredded chicken, buffalo wing sauce and some of the cheddar. Add that to the slow cooker, sprinkle with more cheddar, cover and cook on LOW a couple of hours. It’s the most hands off recipe! Make sure your cream cheese is softened, otherwise you won’t be able to mix it all together. For a dip with a slight kick of heat, use the buffalo wing sauce as the recipe states. To make it more mild, use a regular hot sauce (like Frank’s Red Hot). 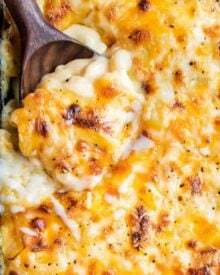 Using a block of cheddar cheese and grating it yourself make it more gooey, but pre-shredded cheese will work as well. 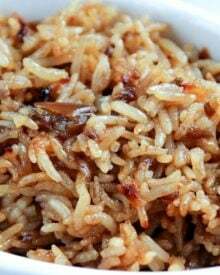 To double this recipe, double all ingredients, use a 6 quart slow cooker and cook for 3-4 hours on LOW. Normally I like to serve this dip with tortilla chips (or the scoop version), Fritos, pretzels (or pretzel thins), or crackers (like Ritz or Club). If you’re going for a true authentic buffalo chicken wing flavor, celery or carrot sticks would be a great option too! You sure can! Mix up the recipe as directed, but instead of transferring to a crockpot, transfer to a lightly greased shallow baking dish, like a pie pan or 2 quart baking dish. Bake at 350 F degrees for 20-30 minutes, until hot and bubbly. My favorite way is to use the slow cooker or crockpot. THIS all purpose shredded chicken recipe is an absolute go-to in our house! You can also bake, poach, or cook the chicken in a skillet. Alternatively, you can either buy a rotisserie chicken or, even better, make your own (it’s super easy!!!). Obviously this dip is awesome to make for a party (since it’s practically hands-off), but it’s also great to take TO a party! A 3 quart slow cooker is small and portable, and I promise you, the host/hostess will greatly appreciate you bringing this tasty dip! 3 quart slow cooker – I have the stainless version of this (which is no longer as cheap as I bought it for), but this is the exact model, just in black instead. Want to try this Buffalo Chicken Dip? 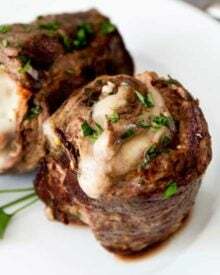 PIN IT to your APPETIZERS or CROCKPOT board to save for later! 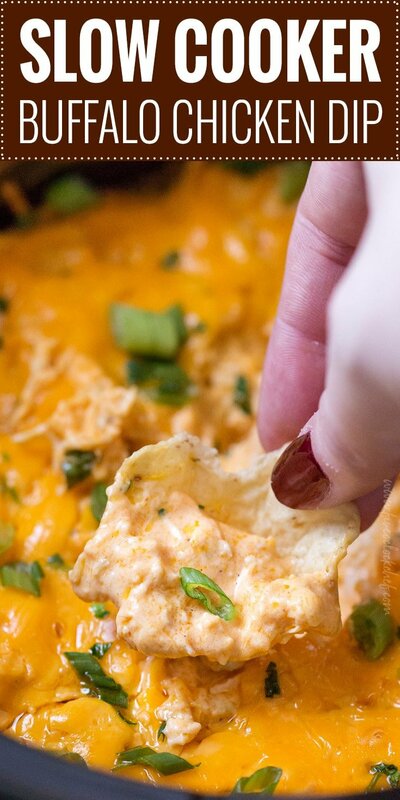 If you're a buffalo chicken wing fan, you have to try this buffalo chicken dip recipe! Pop everything in the slow cooker and bring it to a party! In a mixing bowl, combine cream cheese, ranch dressing, sour cream, 1/4 cup of the blue cheese crumbles, chicken, buffalo wing sauce and 1 cup of cheddar cheese. Stir to combine well. Lightly spray a 3 quart slow cooker with non-stick cooking spray. Transfer mixture to slow cooker and top with remaining 1 cup of cheese. Cover and cook on LOW for 2-3 hours, until hot and bubbly. Sprinkle with remaining blue cheese, green onions and parsley (if using). 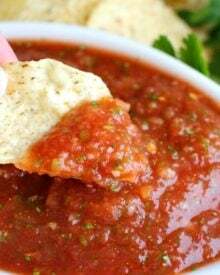 Serve hot with tortilla chips or celery sticks. How long should I leave it in the crockpot if I use chicken breast, uncooked? I’ll have them cook inside the crockpot with othe ingredients. I haven’t tested that specifically, so I can’t say for certain. This sounds delicious but I don’t have a crock pot ,can it be made in the oven ? I just won first place in the office dip contest with this! Thanks for a great crowd-pleasing recipe! Question, if I’m wanting to make this in a 6 quart cooker instead should I just double all of the ingredients? Not experienced at cooking but wanted to make this for game day. Thanks! Made this for my fiancé to take to a baby shower last night, turned out great. Added a little Cayenne to spice it up and nixed the parsley. Also substituted Feta for Bleu Cheese and I think turned out great. Question: (from a bachelor that’s now kitchen saavy) Could I put all the ingredients into a crockpot, and store it in the refrigerator overnight, before cooking on low the next day? I realize this is a dumb question for most of you, please just help me out until I get better! 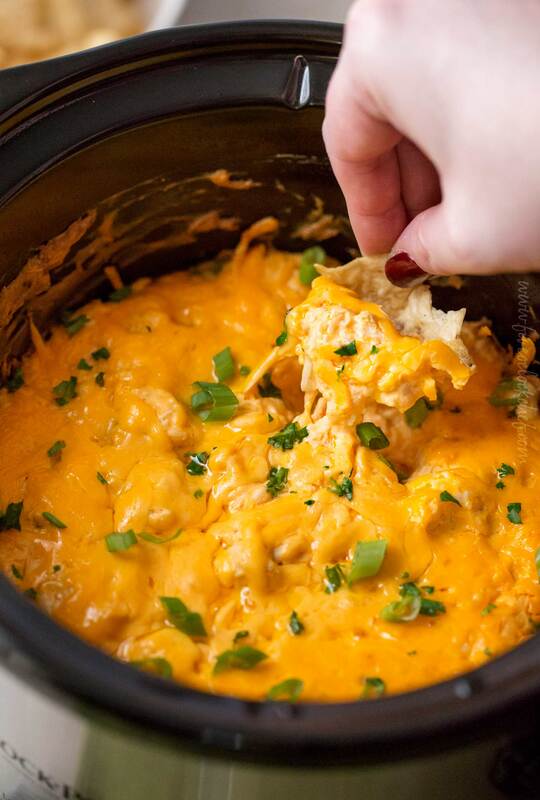 This looks like an amazing dip for game day and parties! 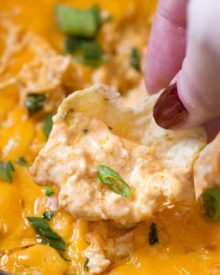 Buffalo chicken dip is one of my favorite appetizers! I love that this one is made in the crockpot! This is perfect for our weekend movie night! It looks fantastic! 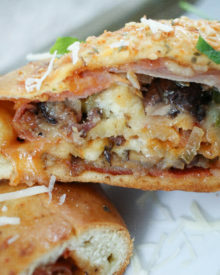 Love how easy this is using a slow cooker! Perfect way to keep it warm during the party too. My family and I could make a meal out of this! So yummy!! This looks so perfect for any party! I’m sure it goes fast! Yes please – this looks so delicious!